Would You Like a Hanging with Your Last Meal? I’m sure you’re rarely asked that, but if you’re a condemned prisoner in New Hampshire or Washington State, you might be given that choice. (In Utah, an inmate can opt to go before a firing squad if lethal injection cannot be done). Countries around the world still consider hanging their primary method of execution, but in the United States, lethal injection rules the prison roost. California outlawed hanging in 1937, replacing it with the gas chamber at San Quentin. Other states abandoned this method due to botched hangings, such as when Eva Dugan ended up decapitated in 1930 in Arizona. The idea of choosing how to die may seem like an absurd notion, but for New Hampshire’s and Washington State’s death row inmates, it’s a decision they face. Length matters. 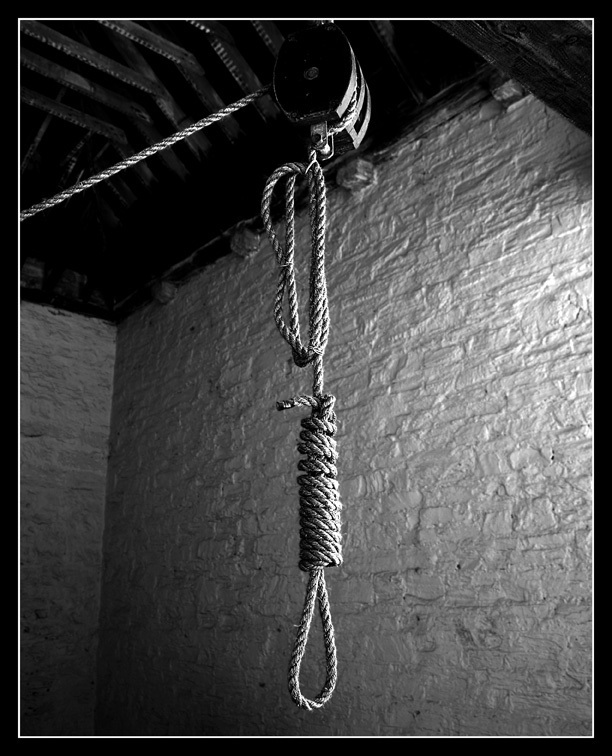 In order to facilitate a “perfect” execution on the gallows, the weight of the prisoner is taken to determine the proper length of the “drop” through the trap door. Decapitation can result from a rope that it too long. If it’s too short, death (by strangulation) can take up to 45 minutes to occur. Today, sandbags are used for a test run the day before the execution. Much importance is place upon the rope, which should be 3/4-inch to 1 1/4-inch in diameter, boiled, and stretched to eliminate recoiling. At Folsom, executioners soaked the Italian hemp for 24 hours, then stretched it for a number of months before the hanging. Records at Folsom indicate that all 93 men died from “instant broken necks.” Upon arriving at the gallows, the prisoner’s hands and legs are bound and a black cap is placed over their head. The executioner secures the noose around the inmate’s neck and at the warden’s signal, the trap is dropped. Folsom’s noose featured a “submental knot,” which when placed against the back of the neck, ensured the mostdamage to the vertebrae. Ideally, it brought immediate unconsciousness and death within roughly 9-15 minutes. The United States saw it’s first lethal injection in Texas in 1982. Since then, there have been nearly 1100 executions in the U.S. 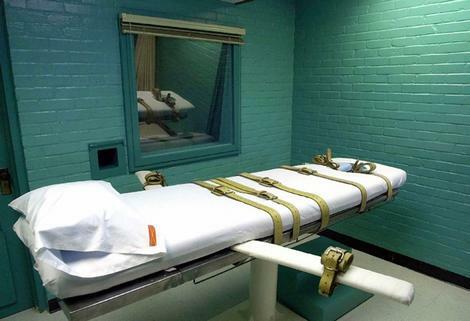 In fact, tomorrow (April 5th), two lethal injections are scheduled to take place; one in Texas and one in Arizona. So what could go wrong? Plenty. Botched executions happen more often that you might think. The Death Penalty Information Center lists only 31 most seriously botched cases of lethal injection since 1982. Strapped to a gurney, the condemned prisoner is injected with a harmless saline solution, then as witnesses watch, he or she is given an anesthetic to put them to sleep. Pavulon or pancuronium bromide, is then administered to paralyze the entire muscle system and stop the inmate’s breathing. The piece de resistance is potassium chloride to stop the heart. Botched executions can result from a number of reasons. Oftentimes, they occur due to technician error. Because of medical ethics, doctors are not allowed to administer the lethal drugs. Inexperienced technicians sometimes inject the poison into the muscle, missing the vein. In 1990, an inmate suffered excruciating pain when the inserted needle pointed at his hand, and not his heart. Another culprit of a botched job is a history of intravenous drug use by the inmate. Damaged veins can be uncooperative, causing long delays in the execution. Some of these condemned men actually helped their executioner find a usable vein. Another reason, are prisoners having unforeseen reactions to the drugs causing painful spasms. For some, death took up to an hour and thirty minutes to occur. Every form of legal execution in the U.S. (gas chamber, electrocution, lethal injection, hanging, and firing squad) sports a history of mistakes. I imagine however, the condemned prisoner isn’t necessarily thinking about the potential mistakes in his execution, but the mistake that ultimately led him to this decision: Hanging or lethal injection? Categories: Death Penalty, Folsom History | Tags: botched executions, death penalty, Folsom hangings, hangings, lethal injection, noose, writing | Permalink. Wow…this is intense. Maybe the French had it right with the guillotine. Not that a botched beheading would be any more pleasant…. I have an idea: drop convicts into a tank full of hungry “Sharks, etc” recycling, no mess to clean up. May 3, 2015: Between the Pages, 88.9 KRFC (Fort Collins) 6-7 p.m.
May 12, 2015: True Murder Podcast, 7:00 p.m.